Going away on a boat trip with my second breakfast, my luncheon and elevenses packed in my travel pack! 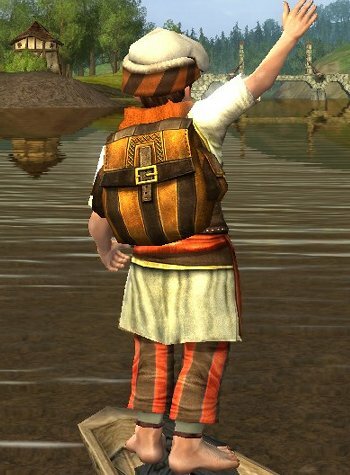 This outfit features a “tunic and pants” cosmetic item that actually belongs to the pirates outfit, but can be used as a regular outfit if complemented by other more ordinary items. The hat is a quest reward but the graphics are not uncommon and this hat appears in game in several places. The scarf is a cosmetic from the Yule Festival, the travel pack is a cosmetic from the gift boxes. Thank you! I am so in love my little hobbit girl. She’s my favorite model by far! What other hats have the same model as the Hat of a Healer reward? 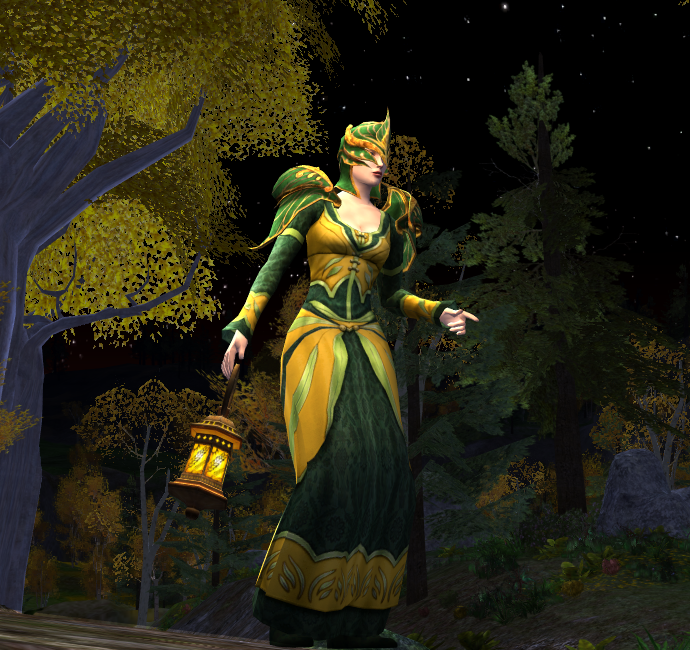 As I really want this set for my female hobbit , but dont want to have to level a RK to 30th just to get that hat. At level 9 you can do the quest “Spider Bane” in Archet: http://lotro-wiki.com/index.php/Quest:Spider-bane. The reward is the same hat! I use that hat from Spider Bane with my hobbit burglar, dyed black, along with a plain outfit also dyed black. Meanwhile, for his decorative outfit, he uses the Corsair Tunic and Pants that you’ve used, dyed green, along with the tophat from the winter festival, also dyed green, and the annivesary cloak similarly dyed.